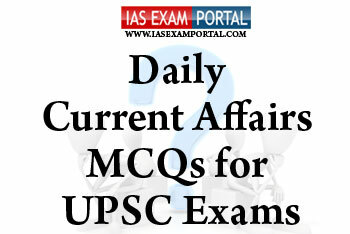 Current Affairs MCQ for UPSC Exams - 04 FEBRUARY 2019 | IAS EXAM PORTAL - India's Largest Community for UPSC Exam Aspirants. Q1. Which of the following statements regarding the regulation of chit funds in India are true ? 1) Chit funds in India are governed by the Chit Funds Act, 1982. Under this Act, the chit fund businesses can be registered and regulated only by the respective State Governments. 2) In case of failure of a chit fund business, the responsibility for winding up such a business also vests with the respective State Governments. Moreover, the Prize chits and money circulation schemes are illegal and are banned under the Prize Chits and Money Circulation Schemes (Banning) Act, 1978. 3) But the Powers of investigation under this Act are vested with anti-corruption department agencies like CBI along with their counterparts in state police. Q2. Which of the following organisations were founded by Bal Gangadhar Tilak? 1) Know My India Programme is a unique programme initiated by the National Foundation for Communal Harmony (NFCH) to bring together financially assisted children of the Foundation from different States/Regions of the country to promote oneness, fraternity and national integration. 3) The NFCH is a statutory organization under the administrative control of the Ministry of Human Resource & Development , the NFCH sponsors/conducts different activities for the promotion of communal harmony and strengthening of national integration. Q4. Which of the following statements with respect to the state of forest report (ISFR) 2017 are true ? 1) The total forest and tree cover is 24.39% of geographical area of the country. India was placed 8th in list of Top Ten nations reporting the greatest annual net gain in forest area. 2) According to ISFR 2017, total mangrove cover stands at 4,921 sq km and has increased by 181 sq kms. 7 out of 12 mangrove states have shown an increase in mangrove cover and none of them show any negative change. 3) Forests play vital role in water conservation and improve water regime in area. According to ISFR 2017, water bodies inside forest cover have increased during the last decade. Q5. Frequent events of illegal wildlife trafficking through the porous India-Nepal border has been reported in which of the following tiger reserves of India ?